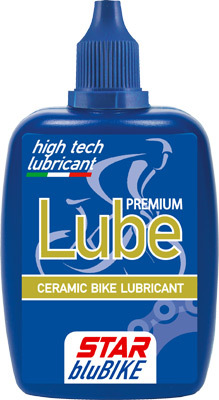 Synthetic lubricant oil for bicycles PREMIUM LUBE CERAMIC is a new generation of synthetic oil enhanced with PTFE and NANO-CERAMIC particles that assure the maximum in long lasting lubrication even in extreme conditions. The use of particular additives renders all moving parts particularly silent and protects from dirt. Shake well before using to permit the solid particles in sospension to disperse evenly. Apply product to clean and dry chain while turning pedals. Eliminate with cloth excess of product. Avoid contact with brakes.